For the past five years I haved worked as the project manager for the second NASA Discovery Mission: the Mars Pathfinder Lander 1996 mission. After I graduated from high school I spent four years in the US Air Force attending radio school and working in radio repair on jet fighters. I then went on to get my B.S. degree in Electrical Engineering from Carnegie-Mellon and then an M.S. degree in EE from the University of Southern California. I worked at NASA's Jet Propulsion Laboratory (JPL) in Pasadena, California while taking classes toward my Master's degree. I also did graduate work in the Engineering Executive Program at the University of California at Los Angeles and earned a Masters of Engineering. I've held many different jobs since I began my career at JPL in 1962. I first started out in Deep Space Telecommunication System Engineering where I was involved in the design and development of NASA's Mariner Mars 1964 and 1969 and Mariner Venus Mercury 1973 missions. I also helped design the lander-orbiter relay communications link for the Viking Mars Orbiter and Lander mission in 1976. From 1975 to 1979, I switched gears and managed the development and implementation of the microwave instruments for the NASA SEASAT 1978 Earth Satellite mission, including the first Synthetic Aperture Imaging Radar to fly in space. For the next 11 years I worked in various capacities for the Magellan 1989 Venus Radar Mapping mission including preproject study manager, mission manager and Synthetic Aperture Imaging Radar manager, deputy project manager, mission manager and finally as project manager through Venus orbit insertion in 1990 and the completion of the primary mission high-resolution surface radar imaging map in 1991. For one year ('91-'92) I led JPL's initial studies of NASA's "cheaper, better, faster" fixed-priced, low-cost, quick-reaction Discovery missions. 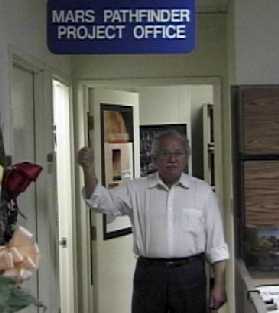 This lead me to working as the project manager for the Mars Pathfinder Lander mission. My hobbies include photography, gardening, golfing, skiing and mountain climbing (I have trekked twice in the Himalayas! ).